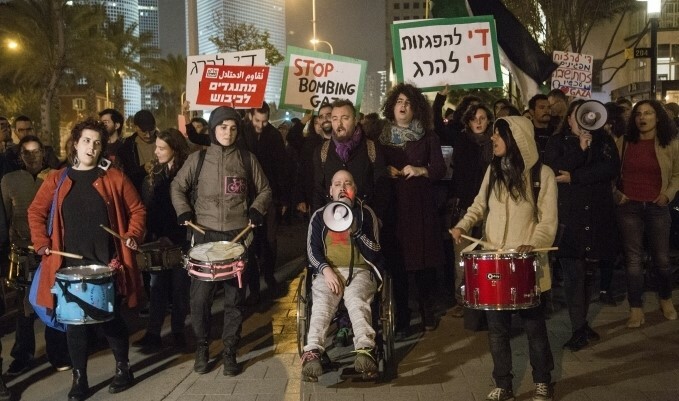 Hundreds of Israeli peace activists, among them members of Hadash and the Communist Party of Israel, held a demonstration on Saturday evening, March 30, in solidarity with Palestinian protestors in Gaza. The protesters gathered outside Israel’s main military headquarters in central Tel Aviv, to mark the 44th Land Day and one year since the beginning of the Great March of Return protests. The protesters waved Palestinian flags, held signs in support of the Palestinian right of return and red Hadash placards in Hebrew and Arabic against the occupation, and chanted slogans against the 11-year blockade of the Gaza strip. The demonstration was held only hours after tens of thousands of Palestinians protested at several locations along the border fence surrounding the Gaza Strip to commemorate Land Day and one year to the Great March of Return. As usual, Israeli troops used live ammunition, rubber-coated metal bullets, and tear gas to disperse demonstrators who approached the fence. According to the Gaza Ministry of Health, Israeli snipers killed three 17-year-old boys during the protests, and more than 300 others were injured, including five who were wounded critically. The Palestinian fatalities from Saturday’s Gaza protests were Adham Amara, 17, who was shot and killed east of Gaza City, and Bilal Mahmoud Najjar and Tamer Abu el-Khair, both 17, who were shot east of Khan Yunis in the southern Gaza Strip and who died shortly after in hospital.